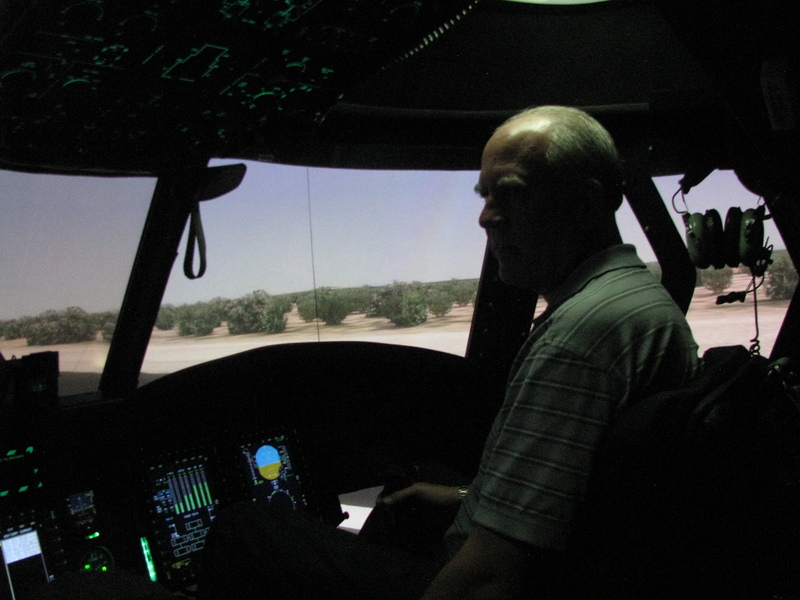 EAA Chapter 1570 President, John Keithly, announced a “Christmas present” for those who might be able to make it out to El Paso’s Fort Bliss this past week to try their hand at flying a huge US Army Chinook Helicopter – – – by way of one of the Army’s realistic Flight Simulators. 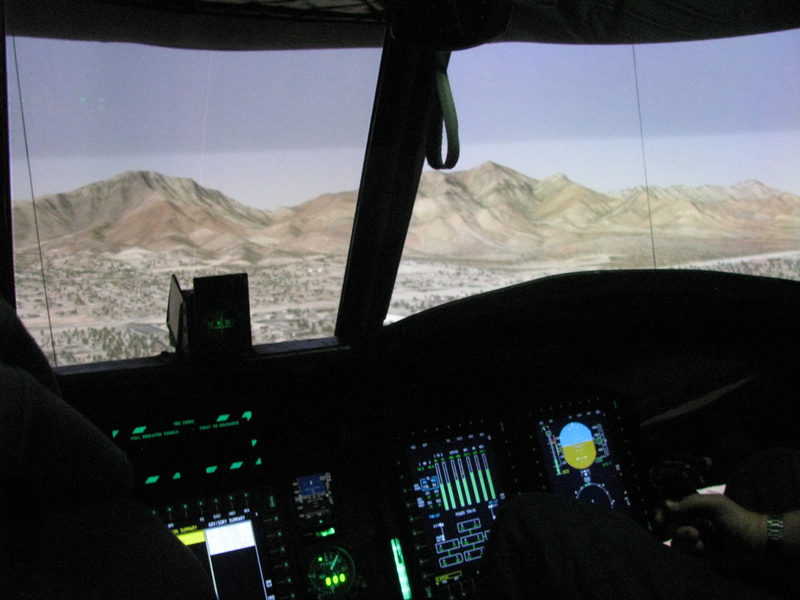 These large flight simulators are so realistic that the combat pilots get comparable flight time logged for every hour they fly in the large simulators. Click on any photo below to see it in full size and in high resolution. 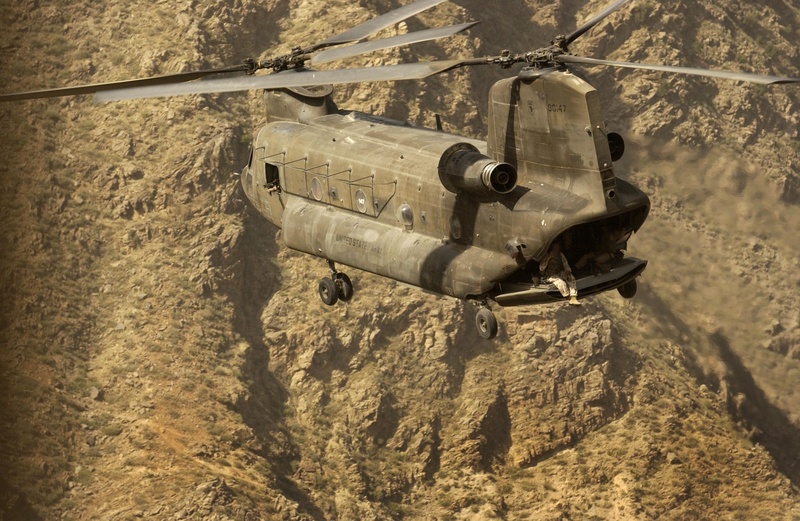 Army Chinook photographed in Combat over Afghanistan. Notice the soldier in the rear open ramp door. John Signorino, Chapter Vice President, himself a former Army Helicopter Pilot, had taken advantage of the Christmas Holiday break for many of the Army pilots at Ft. Bliss’ Biggs Army Airfield. 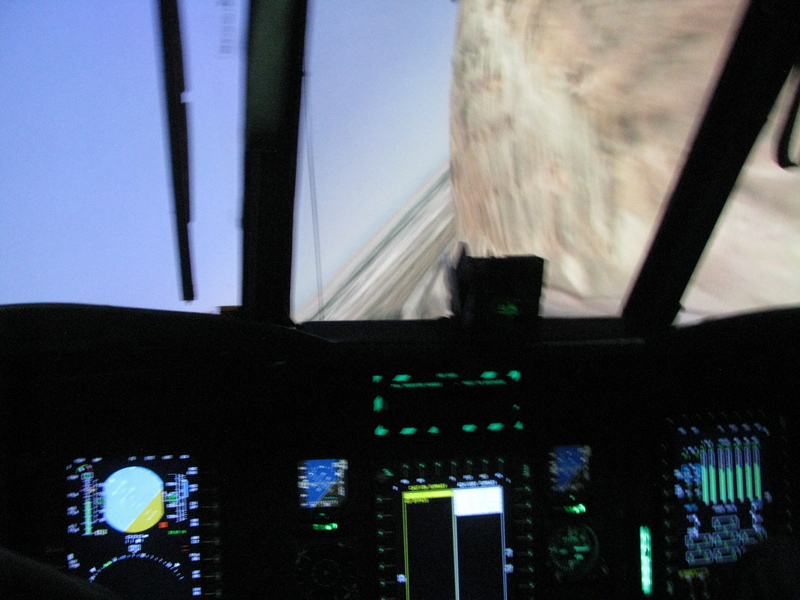 With the aviators on leave for the holidays, there was a rare opening in the otherwise tightly scheduled Biggs Helicopter Flight Simulators. 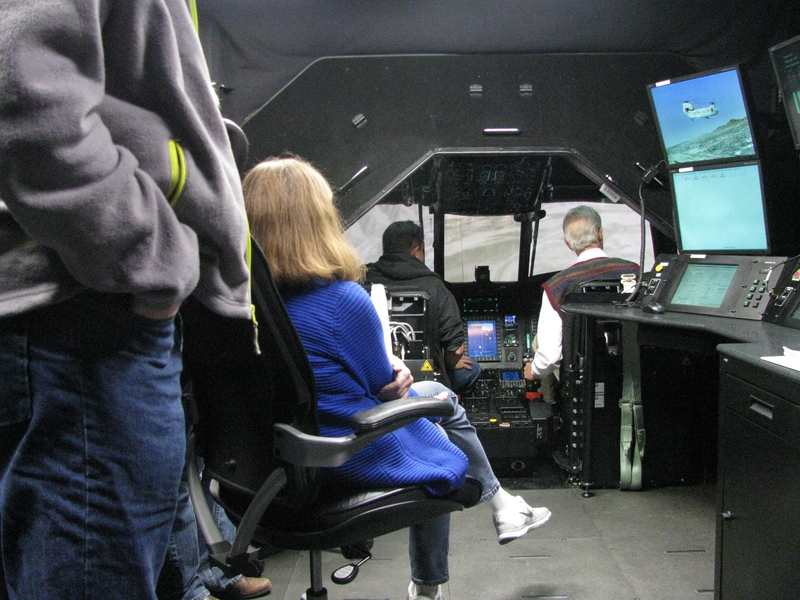 This made it possible for some of the Chapter’s members to actually try out their hand at flying a helicopter, by way of this extremely sophisticated simulator. None who took advantage of this rare opportunity had ever flown a helicopter, but only fixed wing aircraft. The members who took this opportunity quickly discovered that there was a significant – and quite challenging – difference between flying fixed and rotary winged aircraft! But, under the guidance of the highly experienced John Signorino as their Flight Instructor, each of the volunteers were actually able to “fly” this big twin-rotored heavyweight. The territory in which each flew was actually a highly realistic depiction of the El Paso and nearby Santa Teresa, NM neighborhoods. 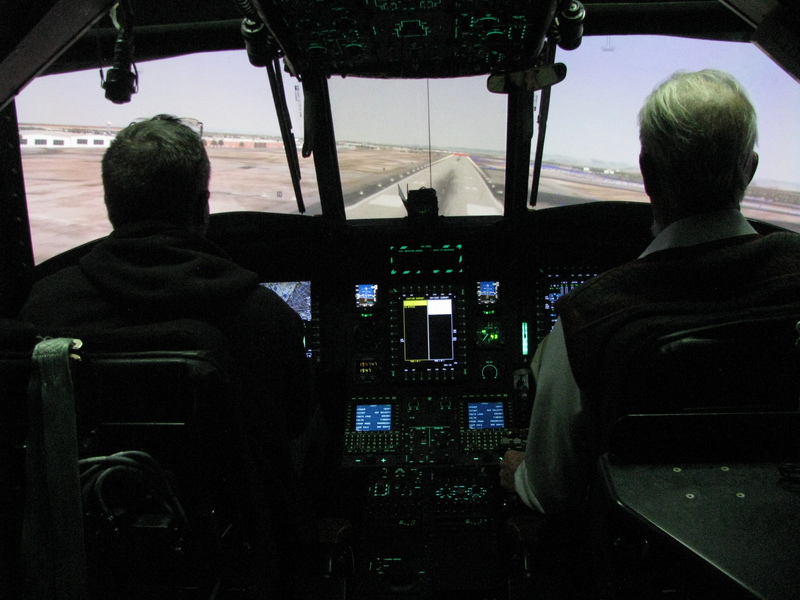 The supervisor for this adventure was Robert D. Eagle Carnahan, himself a former Army Pilot and now a civilian contract Simulator Instructor, who would normally be busily giving flight and emergency practice training to the active duty pilots at Biggs. 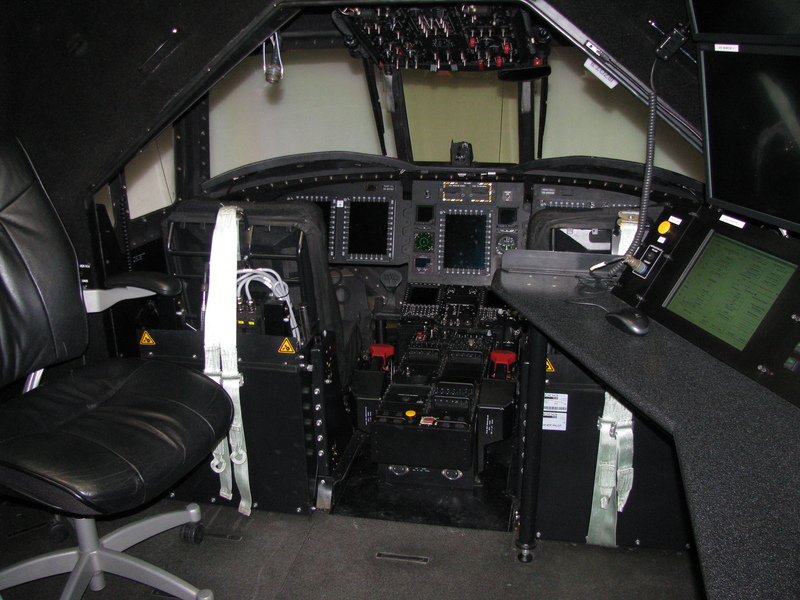 While these large simulators are expensive, the one the Chapter members used costing approximately $13,000,000, using one is but a fraction of the cost involved in operating and actual Chinook. 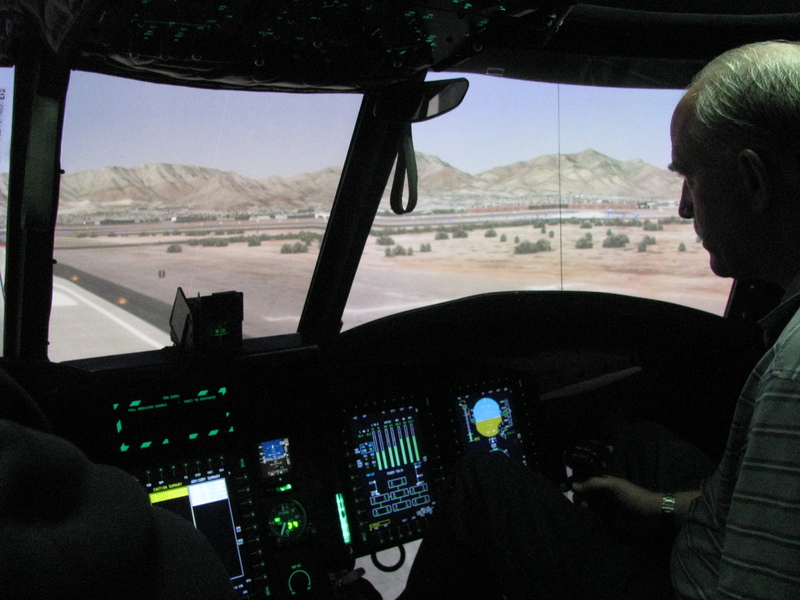 The simulator only costs about $430 an hour, compared to $12,000 (yes, that’s in thousands of dollars) an hour for the Chinook, itself. 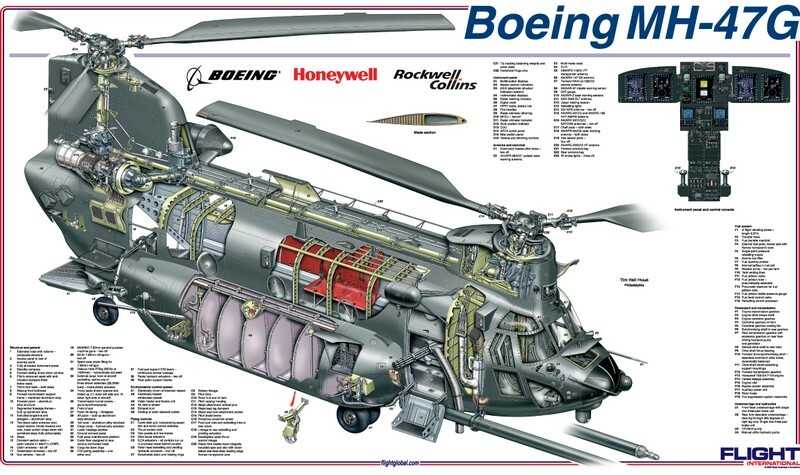 Each new Boeing CH-47 helicopter cost the military between 18 and 25 million dollars. These heavyweights have been in service for a surprisingly long period, seeing combat during the Vietnam conflict to the present day . . . over 50 years of active duty. Here, below, is a view of the innards of this big flying machine. 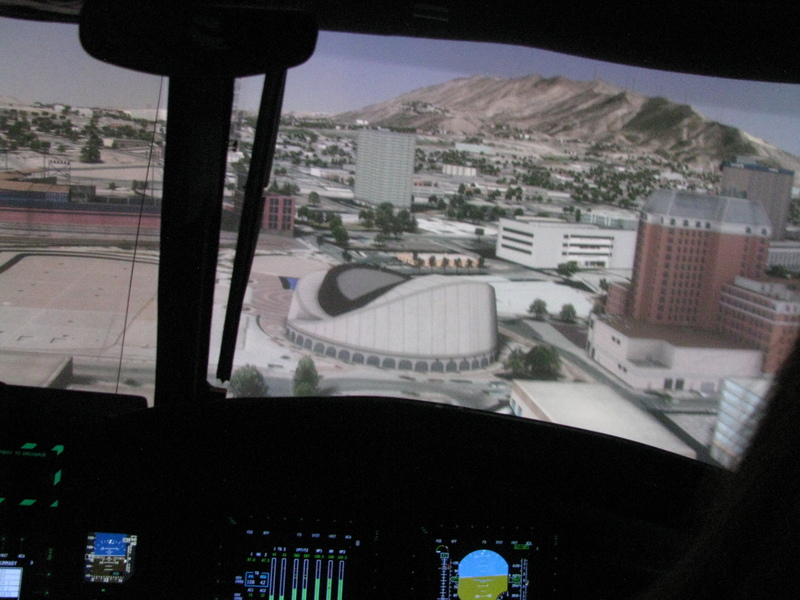 And here, below, is what the adventurous EAA volunteer “chopper student pilots” saw when they entered the Biggs Field simulator. View from the Flight Coordinator’s Deck of the CH-47G’s cockpit. 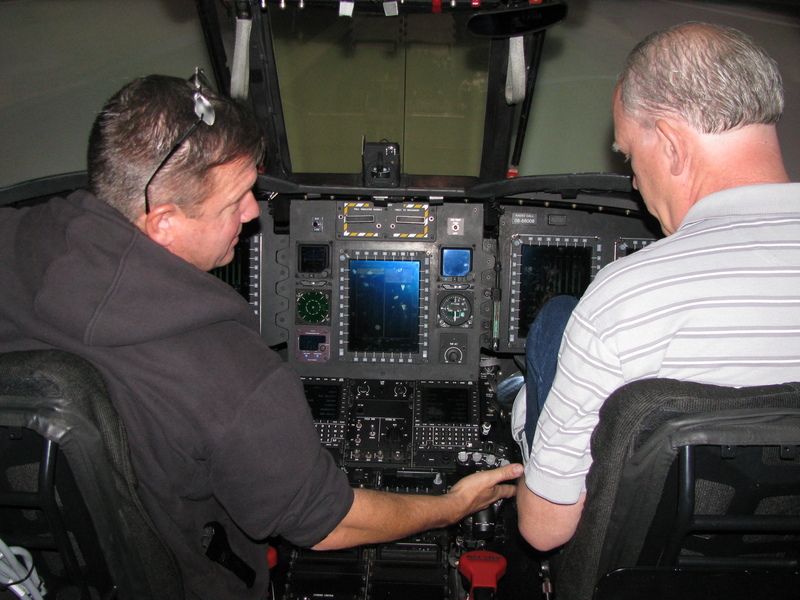 At right is a small part of the control panel at which the instructor pilot sits and uses to control the training flight’s circumstances. The Instructor can instantly cause engine failures, changes in the weather, including wind speed and direction as well as precipitation. 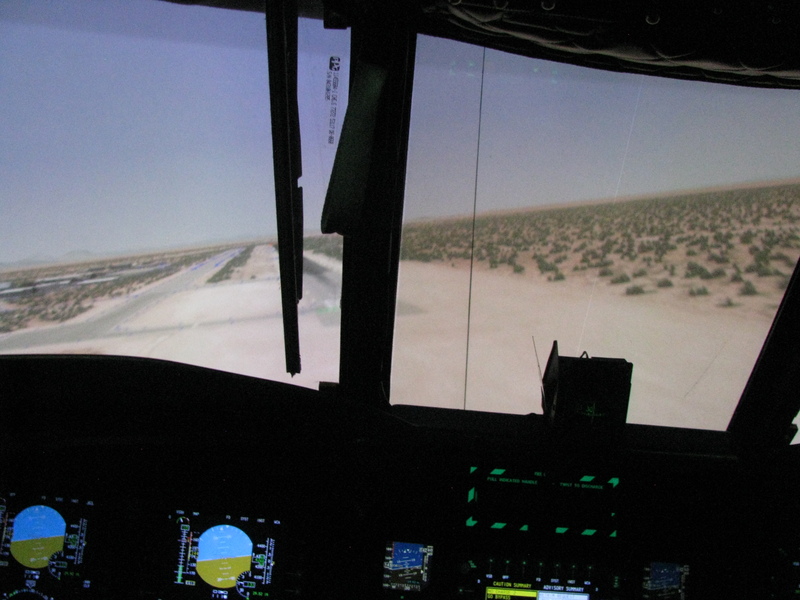 The simulator is not yet turned on for use in this photo, so the view outside the cockpit is of only the large reflecting mirrors, rather than the exterior scenes normally in view. 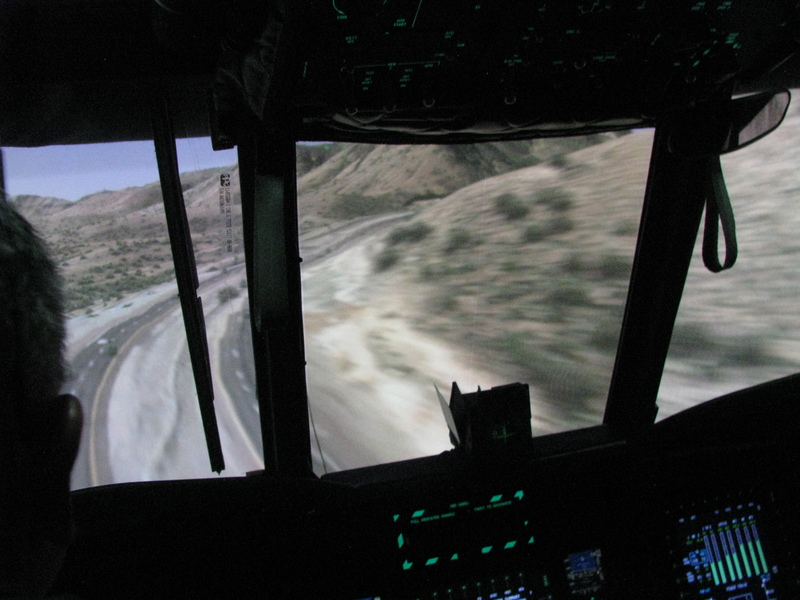 Above the flight deck there are six large projectors which work to create the realistically true panoramic view seen through the Chinook’s windshield of the passing terrain, all of which makes it seem as though one is actually in flight. 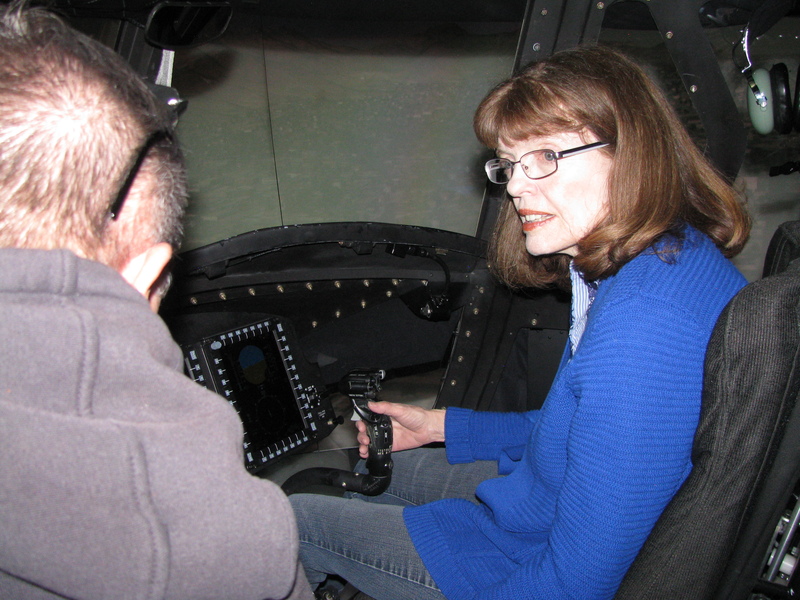 There is even a simulation of the aircraft’s noise and motion, the pilot and co-pilot’s seats vibrate and move as in the real Chinook during flight. 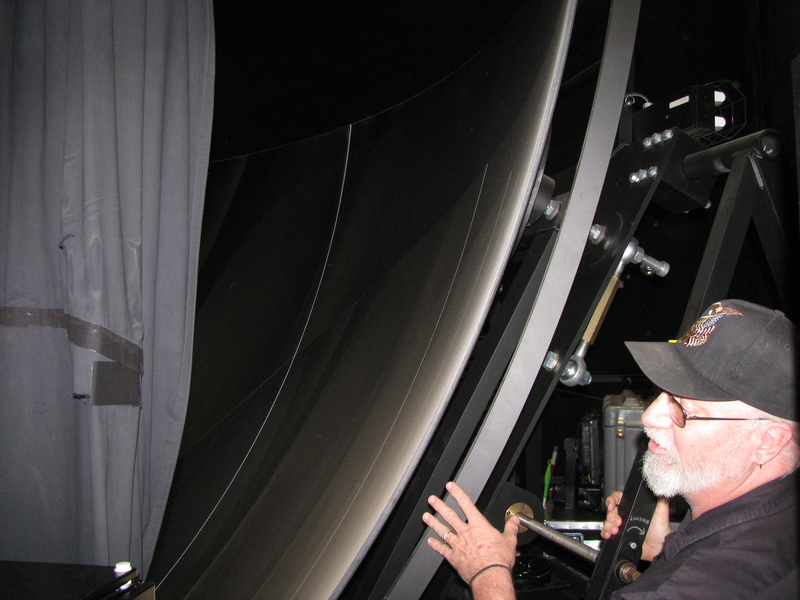 At right, Mr. Carnahan shows the group the large reflecting mirrors (which alone cost almost 1 million dollars!). 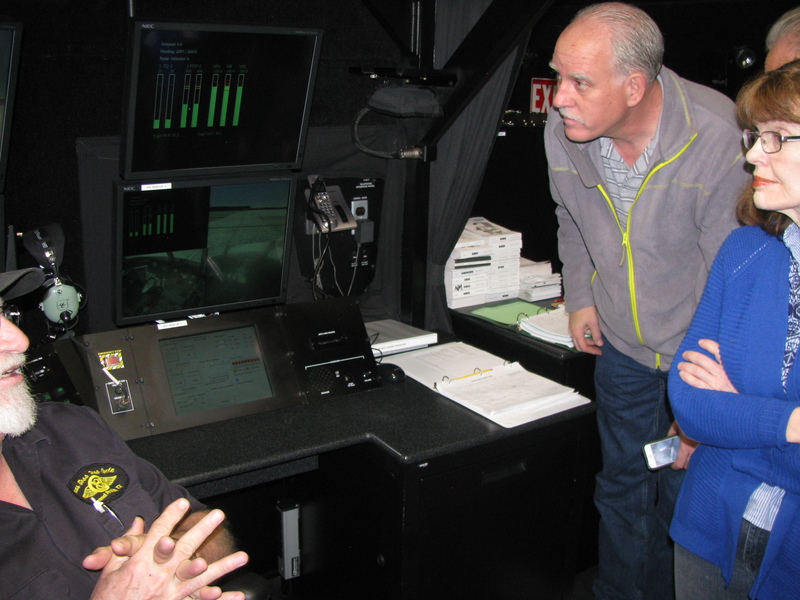 L to R: “Eagle” Carnahan explains his duty station and its controls to Jim Foster and Melissa Keithly. 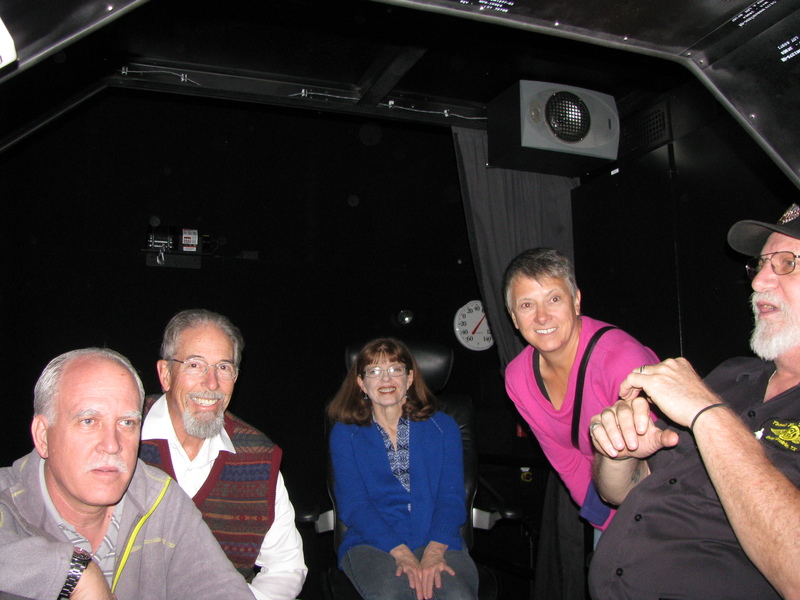 L to R above: Jim Foster, John and Melissa Keithly, Barbara Conrad (EAA Chapter 555 participant) and “Eagle.” The visitors are watching fellow Chapter member Ric Lambart, who is out of view, while trying to fly the big bird from the copilot’s seat. “Eagle” is watching the exterior view of the Chinook, rather than the over-the-pilots’ heads view (straight ahead), which is what the others are watching. 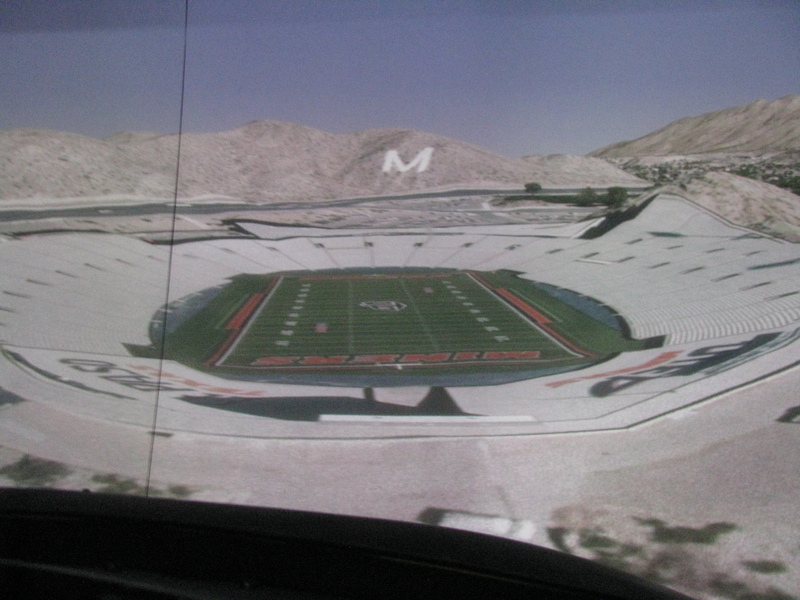 View out the windshield as John Signorino deftly manages to land the helicopter inside the empty University Texas El Paso (“UTEP”) Campus’ Sun Bowl in West El Paso. John set the big helicopter gently down right in mid field. 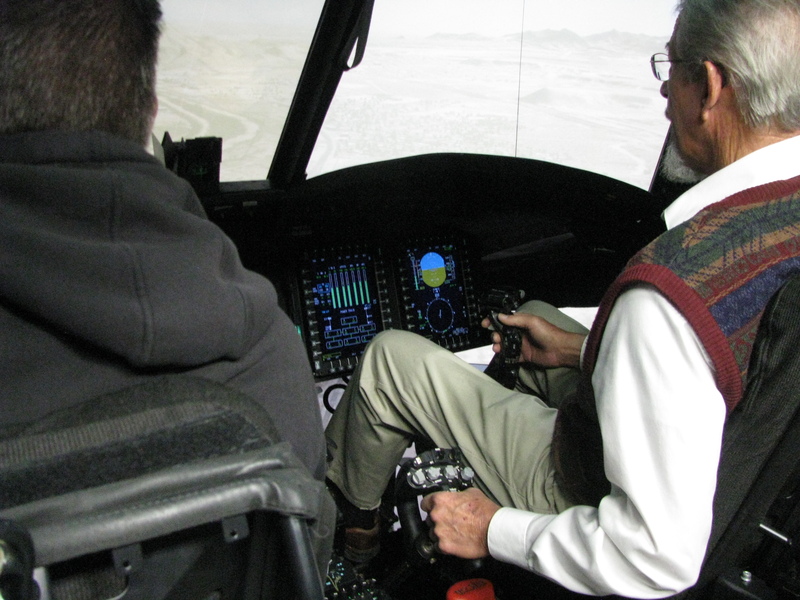 Here (above at left) is John Signorino instructing professional fixed wing flight instructor, Jim Foster, in how the helicopter controls work. The engines (there are two large jet engines on the Chinook) are not yet started, so there is not yet an outside “view” through the windshields. Jim Foster, at right, carefully following through on the controls as John Signorino takes off from Biggs Field towards El Paso’s Franklin Mountains up ahead. Notice the Biggs runway in lower left of windscreen. 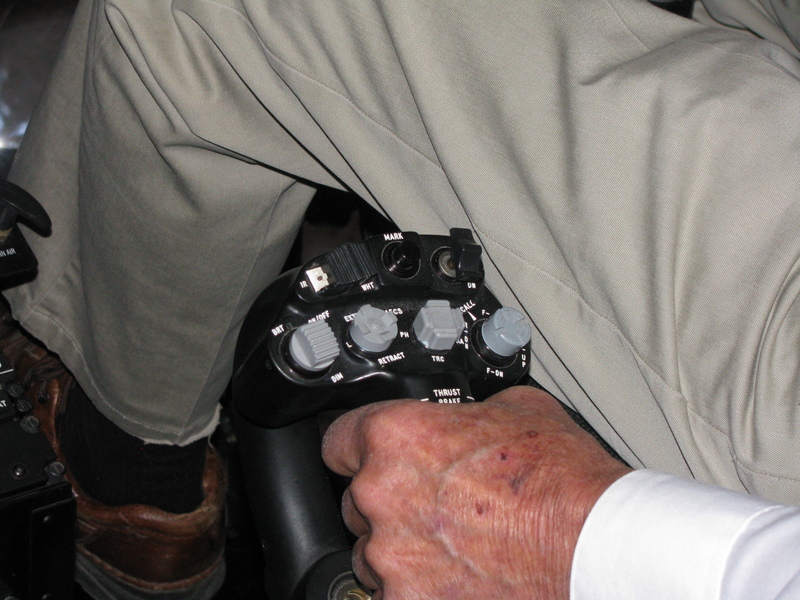 The visiting fixed wing pilots quickly noticed some unusual instruments in the panel, such as the vertical bar indicators in the lower center of photo. These instruments are peculiar to only helicopters, whereas many of the other instruments are also used by conventional (fixed wing) airplanes. The Chinook rapidly approaches the Franklin Mountains’ and the Trans Mountain Pass’ freeway, which is ahead and to the right side of the left windshield panel. 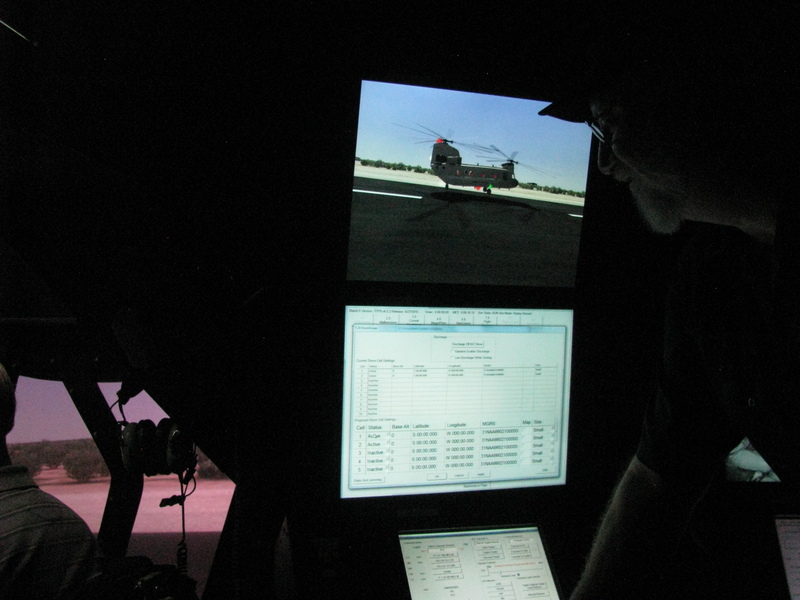 The helicopter, as it maneuvers, is continuously seen from the outside by the Controller at his desk, above. Here it has just crossed El Paso’s Patriot Freeway (to the left behind the ship). Here we see a somewhat harrowing scene, as John Signorino races up the mountain over the Trans Mountain Freeway and toward the Pass. Notice the blurred passing terrain. The Chinook may be an older model of Army Helicopter, but it remains one of the fastest. This speed run through the mountain pass required John to sharply bank the Chinook in order to make the tight turn out into the west valley ahead in the center of windshield. John took this shortcut to the west side so that Jim might be able to fly the aircraft around the airport at which he works: The Dona Ana County International Jetport. Here is the view as Jim Foster carefully heads toward the main east/west runway at Dona Ana as John meticulously talks him along towards Jim’s eventual landing. View scenario from Controller’s (upper right) screen as Jim Foster lands at Dona Ana Jetport. Notice (at below left) the simultaneous view outside, as he comes to a successful landing. Sitting straight up with satisfaction, Jim surveys the surroundings outside the Chinook after his successful landing at his home airfield. 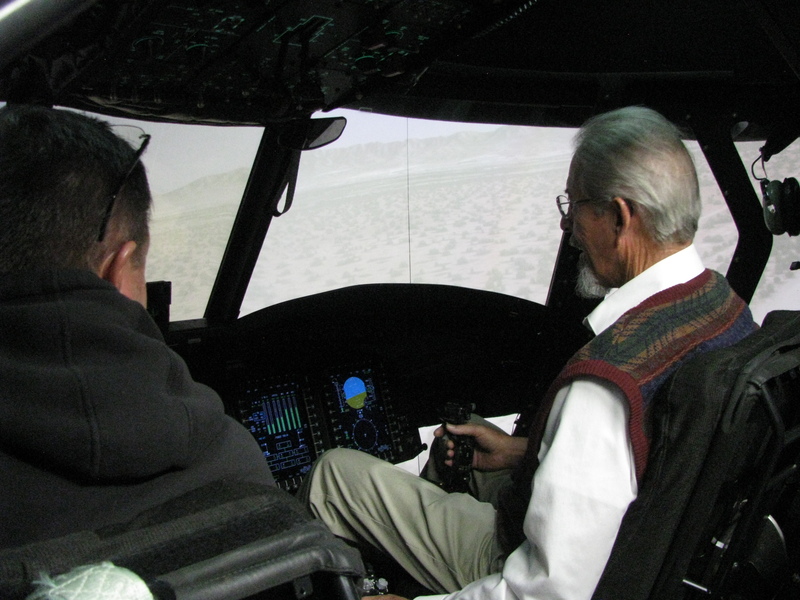 Here, with Instructor John Signorino on his left, John Keithly takes his turn to fly the Chinook, as he follows through on the controls after taking off from Dona Ana jetport, also his home airfield. Above shows John’s hand on the collective control. In order to move it, he must depress the trigger on the underside. Jim Foster and John’s Keithly’s wife, Melissa, watch with interest from the flight Controller’s deck as John flies back to East El Paso from Dona Ana Jetport. 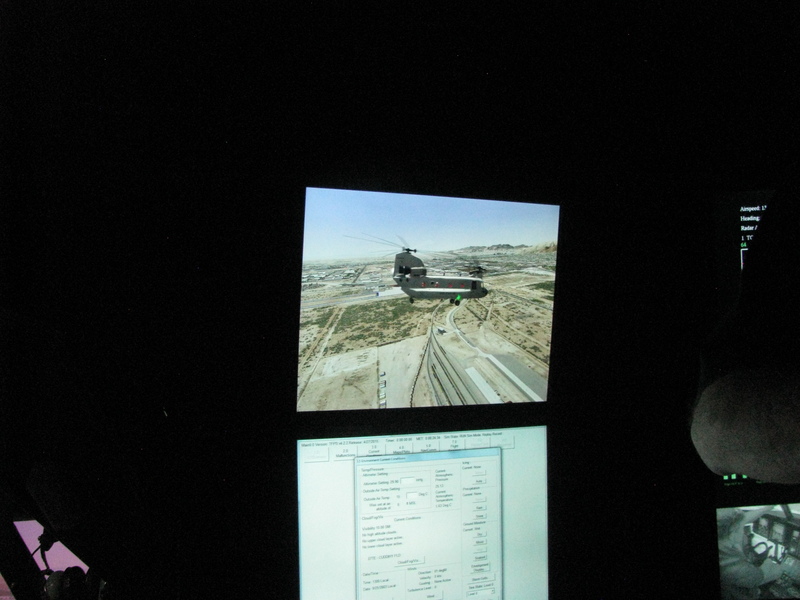 Notice the view of the Chinook (as seen from the outside) on the Controller’s screen at right right. Above is the view as Signorino and Keithly make their approach to land at Biggs Army Airfield. 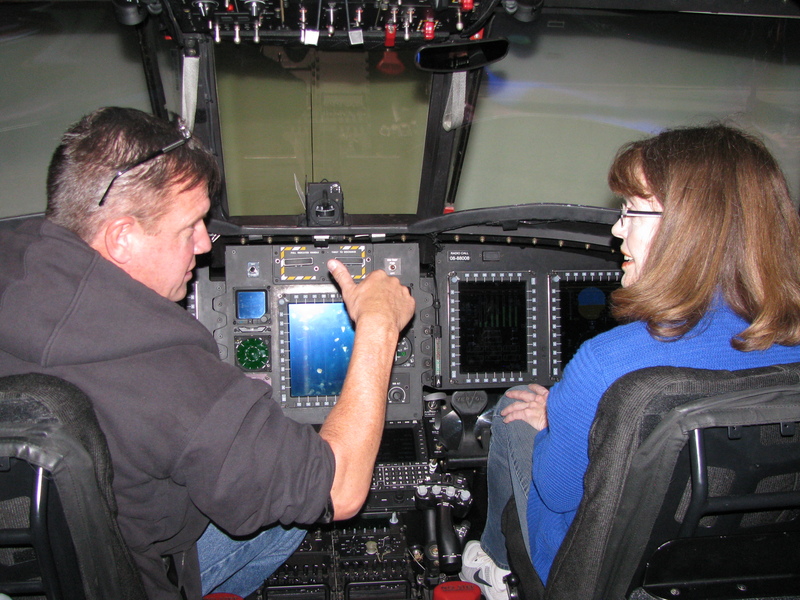 Here, above, we see John Signorino explaining how they will manage this flight training session to Melissa. Next, above, before starting the Chinook up again, John explains how to work the Cyclic Flight Control (in Melissa’s right hand). John Signorino and Melissa flew the Chinook for a sight-seeing tour of downtown El Paso (above). This tour even included frightening passes between some of the city’s sky-scraper buildings! This entire experience was far more realistic than sitting in a movie theater while it’s showing an I-MAX panoramic 3-D adventure film. This entry was posted in HOT NEWS! on December 24, 2017 by FASFRIC.